Following the leaked images of a new version of HTC Sense running on what seems to be HTC's upcoming "M7" flagship, another photo has emerged apparently showing Sense 5 on Verizon's Droid DNA. 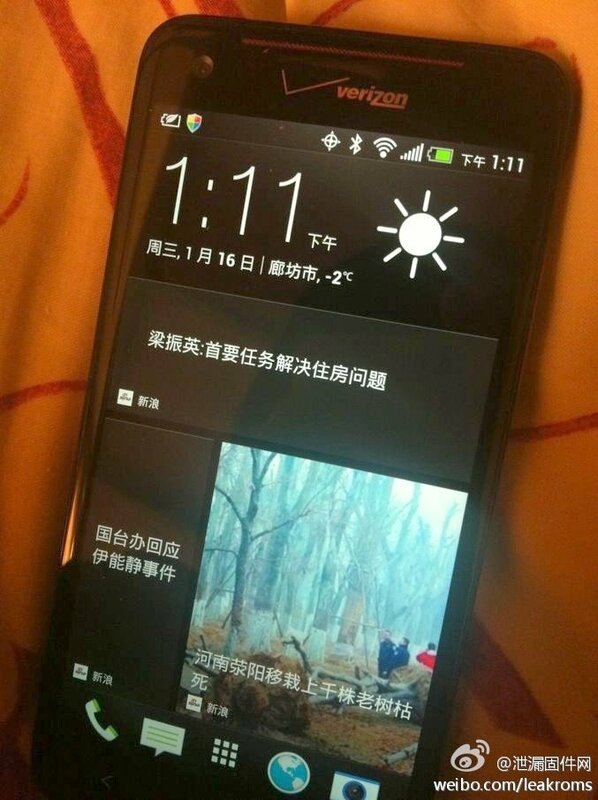 The shot surfaced via the user "LeakROMs" on Chinese social network Weibo, and it's a dead ringer for the software pictured on the supposed M7 device just a few hours ago. In addition to the re-worked icons, we can also see the new Sense weather widget and a home screen split into dedicated sections for social networking, news and tutorials. Now, this is far from official confirmation that Sense 5 is headed to 2012 devices line the DNA. But it seems to show someone, somewhere is experimenting with a new version of HTC's UI on existing handsets. Who knows what form the finalized version of Sense 5 might take, but the prevalence of this design across multiple leaks suggests HTC is re-working its software from the ground up. We'll keep you apprised of any further details, and we'll be live from Mobile World Congress in Barcelona next month, where HTC is expected to publicly unveil its 2013 line-up.